Forget dipping your toe in the water. Jump right in and join the Venetians for apertivo time. In the evenings, they wander in and out of tiny eateries called bacari ordering an ‘ombra de vin (glass of house wine) and small plates. But if you want to learn the ropes from a local, join a cicchetti tour. Start at Al Timon, tucked away along the Ormesini canal in Cannaregio and far from the Disney-like atmosphere of the Rialto or San Marco. Order an aperol spritz and choose a few cicchetti (the Venetian take on Spanish tapas) from the evenings’ selection. Just be sure to be there when Al Timon opens at 5pm because it’s a tiny establishment with just a couple of tables. 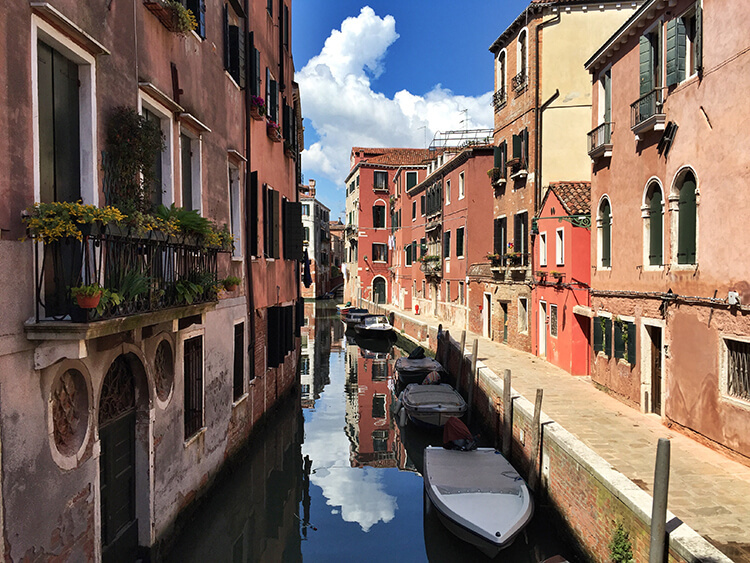 A 10-minute stroll away is another of our favorite Venetian bacari. Alla Vedova cooks up around 500 meatballs daily, but you’ve got to be quick because the locals know these are the best meatballs in Venice. Once they’re gone, they’re gone. And don’t expect them to be served smothered in tomato sauce and atop a bed of spaghetti; these no frills meatballs will be handed to you on a napkin. At €1-2 a piece, you can continue eating your way from these little pubs all evening until they close around 1am. Some of our other favorites not to miss are Cantina Do Mori, All’Arco, Osteria Alla Ciurma and Enotecca Al Volto. 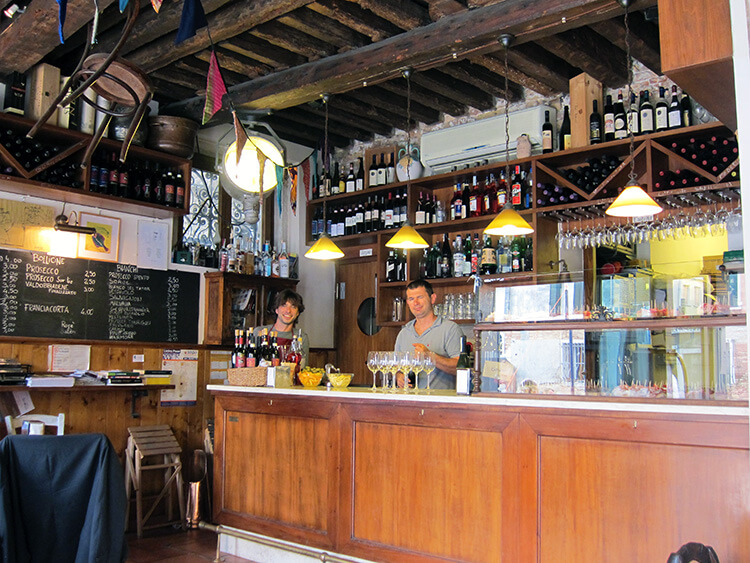 And if you don’t want to do-it-yourself, book a Venice food tour. Venice is just one island among more than 100 in the Venetian Lagoon. 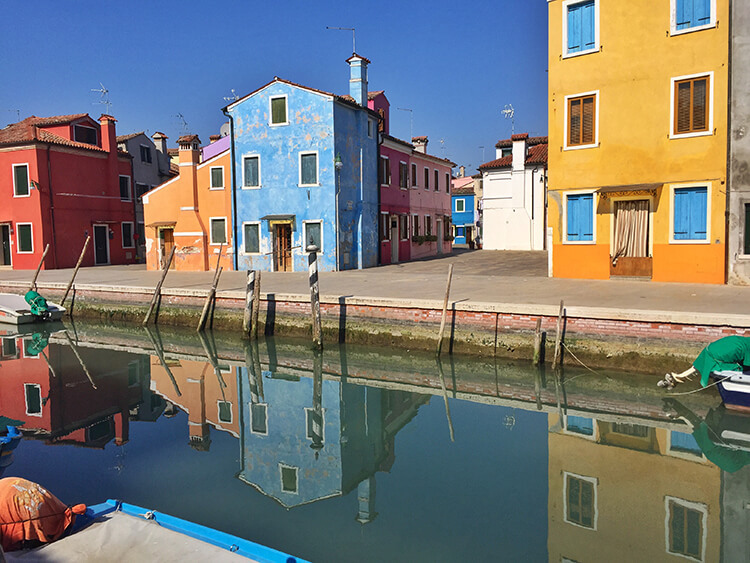 Purchase a vaporetto ticket and head over to the colorful fisherman’s island, Burano, also famous of its lace making. Burano is small and you can easily cover it from end to end in just a few hours. Don’t miss a visit to the Venice Lace Museum and be sure to sample the S-shaped cookies at Panificio Pasticceria Palmisano Carmelina. Enjoy a leisurely canal side lunch. 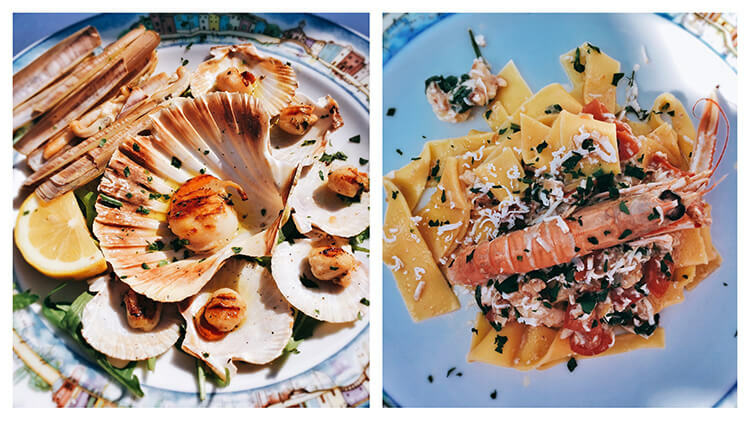 Al Gatto Nero is one of the best traditional restaurants in the Venetian Lagoon and it’s been run by the same chef since 1965. 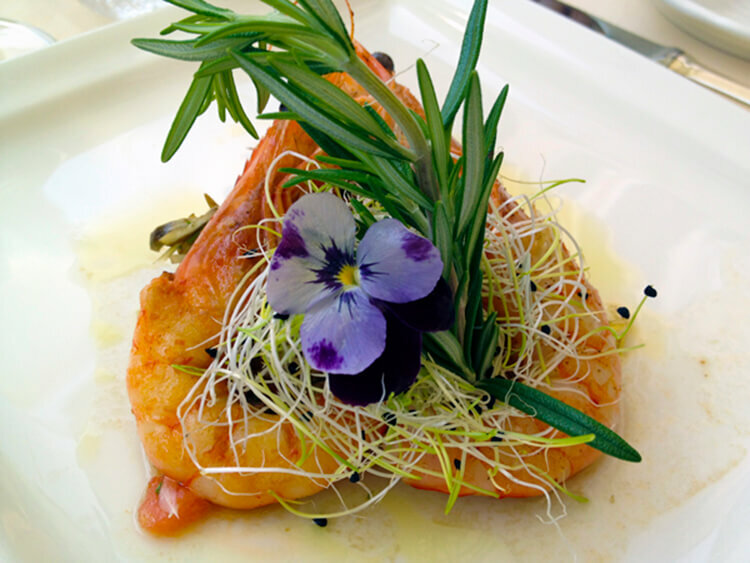 A sign of an authentic Italian restaurant, the menu changes daily based upon the fresh catch and the in-season produce. Burano is connected to another tiny island in the Lagoon by a small footbridge. 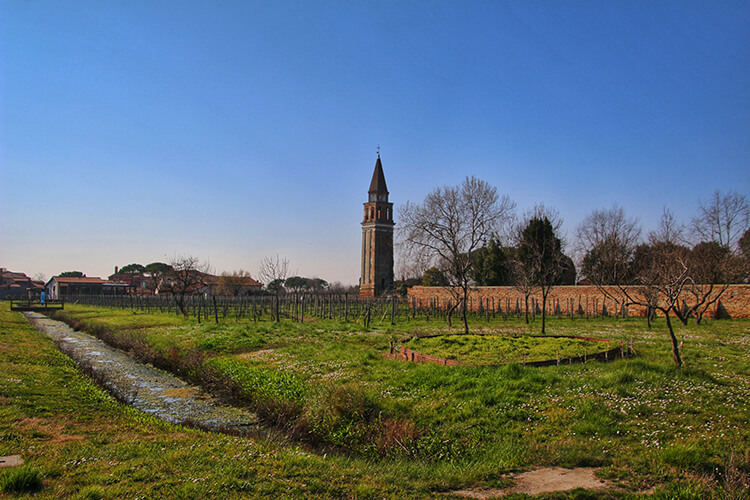 The island is Mazzorbo, home to the only vineyard in the Venetian Lagoon. Don’t miss the opportunity to taste the unique Dorona grape that is only grown here. Everyone queues up for a view of Venice from the Campanile in Piazza San Marco, but we think the better view is from atop the 60 meter high bell tower at Chiesa di San Giorgio Maggiore just across the lagoon. You’ll get the ultimate view of Piazza San Marco and without the lines, because most people don’t take the vaporetto over to this little island in the Lagoon even though it takes less than 3 minutes to cross. Hey, you earned it. Head to the best gelataria in Venice: Gelataria Alaska. Owner Carlo Pistacchi is passionate about making gelato and experiments with new flavors using only the freshest natural ingredients. Ask for a taste by saying “Assagio per favore” and then name the flavor. Carlo will never refuse you! He even always added a little extra scoop of any third flavor I eyed up while ordering my two scoops. Normally, we’d tell you to avoid eating on the Grand Canal. The little restaurants with menus in every language and a Venetian outside trying to lure you in with a free bellini are overpriced and awful. But you absolutely should book a table at L’Alcova Restaurant. 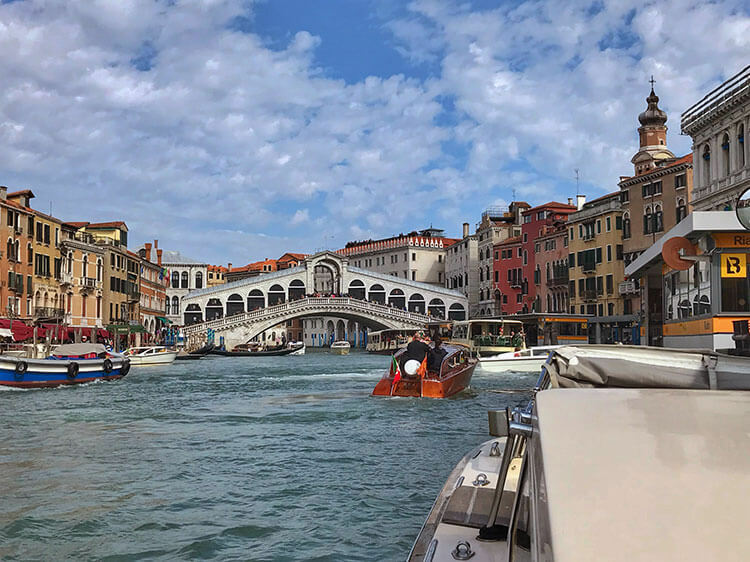 The exclusive restaurant has just nine terrace tables overlooking the Grand Canal and the chef personally visits the Rialto Market daily to select the freshest fish and produce. Between the ambiance of the 15th century Venetian palazzo, the bustling Grand Canal and the modern take on traditional Venetian dishes, you’ll spend your last night in Venice in delectable style. The quintessential Venice experience is a gondola ride, but we also think that they are a bit overrated. Instead of sitting in canal traffic as your gondolier shouts back and forth to his fellow gondoliers, learn to row a Venetian gondola yourself with Row Venice. Everyone comes to Venice and has a gondola ride, but you’ll go home with a bucket list experience and tales to tell from your gondola rowing lesson. It’s the perfect way to end your trip to La Serenissima. 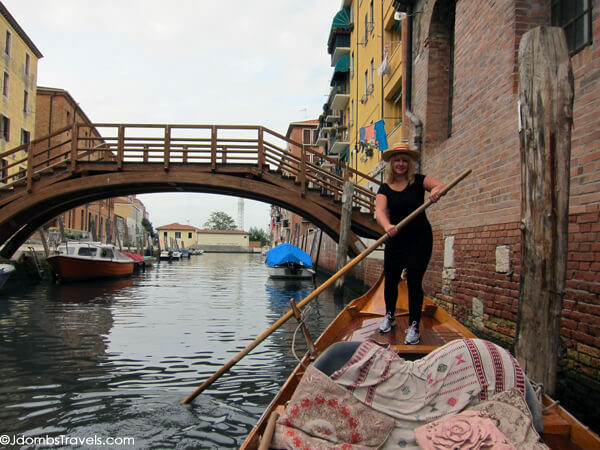 I Learned to Row a Venetian Gondola…And You Can Too! 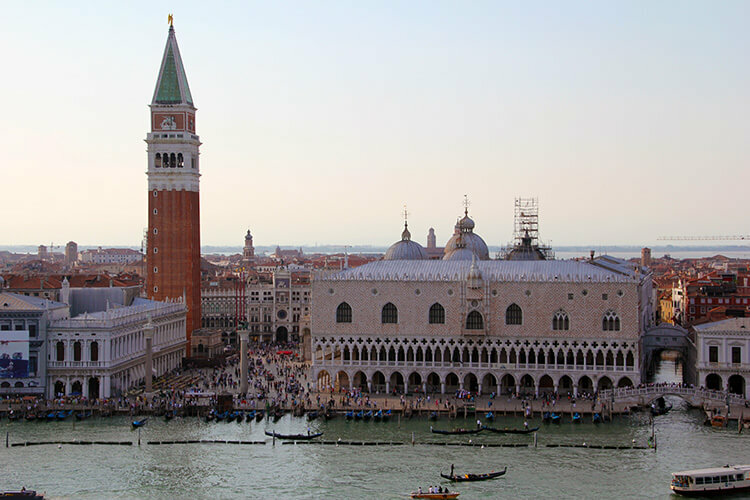 Venice has no shortage of hotels, but choosing one in a great location is essential. Especially as you’ll be arriving with luggage, one of the most important factors is the hotel’s proximity to a vaporetto stop or with easy access for water taxis. Otherwise, you may end up schlepping your luggage up and down Venice’s countless bridges. The Hilton Molino Stucky is a chic hotel that occupies a former flour mill. It’s located on the island of Guidecca, and is about a 10-minute vaporetto ride from Piazza San Marco. 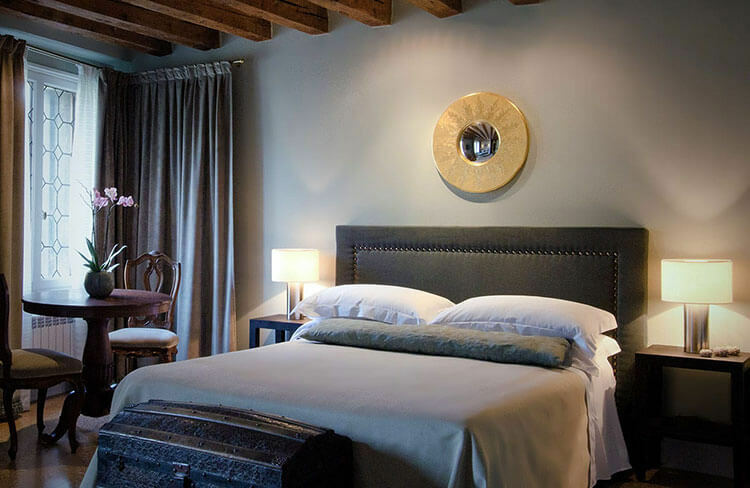 With a complimentary shuttle that whisks guests over to the main island of Venice where all the sights are, this hotel is perfect for visitors looking for a quiet retreat away from the hustle and bustle of Venice. 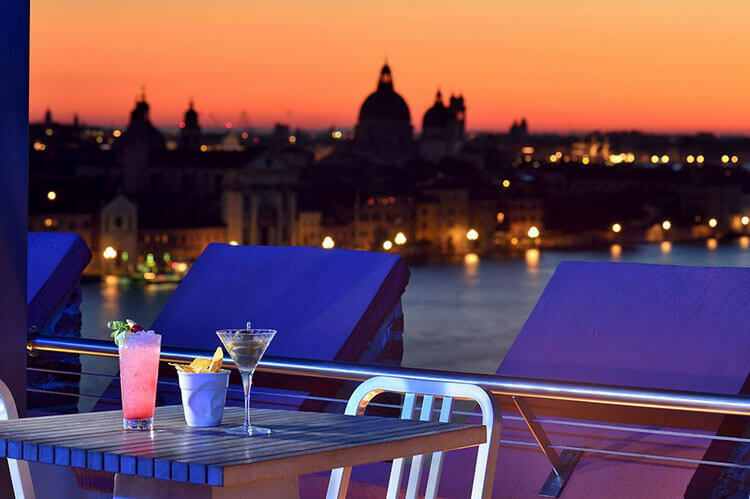 We particularly like the Hilton Molino Stucky for their rooftop swimming pool, because there’s hardly anything better than a refreshing dip after a hot and humid day in Venice. And trust us, it gets unbearably hot. The rooms are spacious and functional, which is a luxury itself. Even the most luxurious of Venice’s hotels don’t have the largest rooms just because of the nature of the buildings. The king size beds are comfortable and the Canal facing rooms have a superb view of Venice. There are onsite restaurants, as well as restaurants and cicchetti bars located on Giudecca if you don’t feel like venturing back and forth to the main island of Venice during your stay. The Hilton’s breakfast is incredibly good with a spread covering just about every cuisine you can imagine. But don’t just take our word. 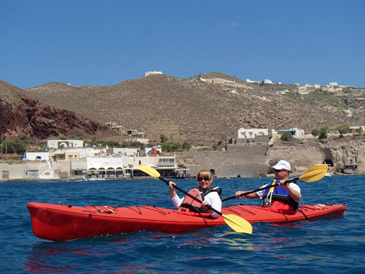 See what other travelers have to say at TripAdvisor. 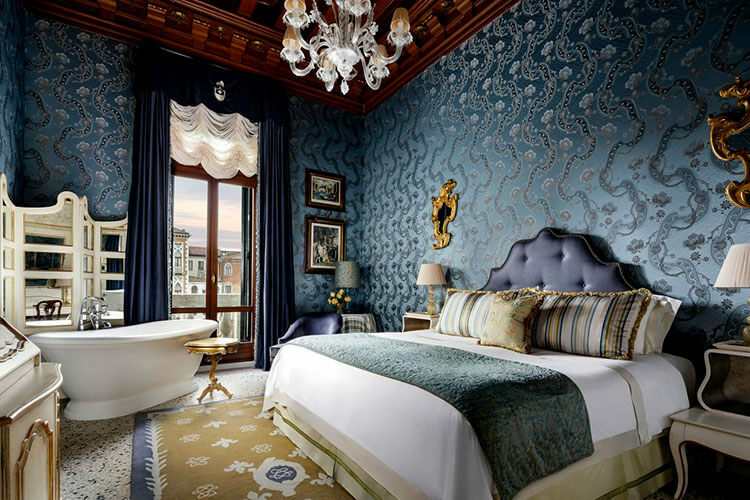 The Gritti Palace Hotel is the epitome of Venetian luxury. It’s located in a palazzo from 1475 on the Grand Canal with views of one of Venice’s most beautiful churches, Santa Maria della Salute. The rooms have sumptuous interiors that make you feel like you’ve stepped back to the luxurious times of Venice past, but you won’t lack for any modern day amenities or technology. The hotel also has a spa. For a romantic getaway in Venice, the Gritti Palace Hotel is worth the splurge. Read the TripAdvisor reviews. The Cima Rosa Boutique Hotel is located in the Santa Croce district and is just a short (and bridge free walk) from the San Stae vaporetto stop. Conveniently, the vaporetto line servicing Marco Polo airport also stops at the San Stae vaporetto stop, making this charming five-room hotel an excellent choice. It’s an easy walk to many of Venice’s sights and close to many good restaurants and bacari. Traveling to Venice is easy with a number of options including budget airline flights from many cities within Europe or via train. Venice is car free, so no matter if you arrive by plane or train you’ll enter the city at Piazzale Roma or the Venezia Santa Lucia train station and can transfer to the vaporetto (water bus) to get around Venice easily. This article contains affiliate links. When you book on Booking.com, Walks of Italy, Urban Adventures or TripAdvisor through our affiliate sites, we earn a small commission at no additional cost to you. I’ve already eaten dinner, but these food pics are driving me insane! Exactly my type of food and I can almost taste everything! The cicchetti look fantastic! Wow, I would love to know what Venice looked like 26 years ago! I bet it was mostly unchanged physically but so incredibly different. That had to have been before the tourists descended in droves. And you wouldn’t have had any of the digital ways to know what to see and do like today. I would have loved that. That seafood … WOW! And you look adorable navigating the gondola! Aww, thanks! I’m definitely not cut out to be a gondolier. My arms ached so much I could hardly lift them for a few days after! Such a terrific informative post! So often we have limited time to spend in a city so we are always looking for guides like yours to figure out what we MUST not miss! These are definitely the highlights. You could really spend an entire week exploring Venice and a handful of other islands in the Lagoon. But so many people come and visit multiple cities on their trip to Italy, so hopefully this guide helps visitors get the most out of Venice. Another Jennifer… Your mom must have gotten the same memo as mine. Not many new members in the club these days..
Love, love love this. I have always wanted to go to Venice and knew that I wanted to be there when the throngs of day tourists were not. Your answer to leave to Burano when the crowds arrive was genius. I wanted to do everything on your list, especially being a gondola pilot. I used to guide whitewater, this might not have the adrenaline factor of a class IV rapid, but I am sure it is pretty darn fun! And yes, I think Jennifer was THE baby name of the late 70s and early 80s. There are always at least a few of us no matter where you go! Great guide, never have been to Italy and Venice would have to be on the list for sure if we get there! Cicchettis you had look amazing yum yum yum! 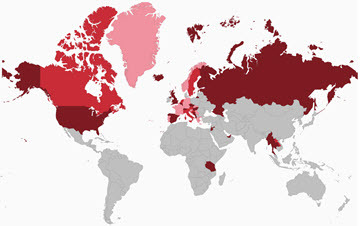 People think of Italian as the dishes served up by most Italian restaurants, but the cuisine is quite varied from region to region. Cicchetti is truly Venetian cuisine! I really love the colorful houses in Burano! They cheer it up even on the gloomy days. I have to hold on to this for future reference. I hear you don’t really need that much time to see Venice’s highlights and you have proved that to be right. I am always down for a quick trip so this is perfect. These are still just the highlights, but if you stay for at least 36 hours you can get a good feel and see quite a bit. You could easily spend a full week exploring Venice and the other islands in the Lagoon though. We were just in Venice this week! We had a great few days exploring the back streets and getting lost in the city. We did manage to make it to Alaska for some gelato (ginger and almond…delicious), so at least we checked that one off! love the idea of learning to do the gondola yourself…didn’t know lessons were available. What a great way to see the city! I love the ginger at Alaska! It’s such a unique flavor and I’ve never seen it anywhere else in Italy. Glad to hear you made it there! I loved reading this guide!! So well put together and I love your pictures as well. Getting advice from locals and expats is my favorite way to learn about what to do and eat in a place, so thank you for sharing your tips! 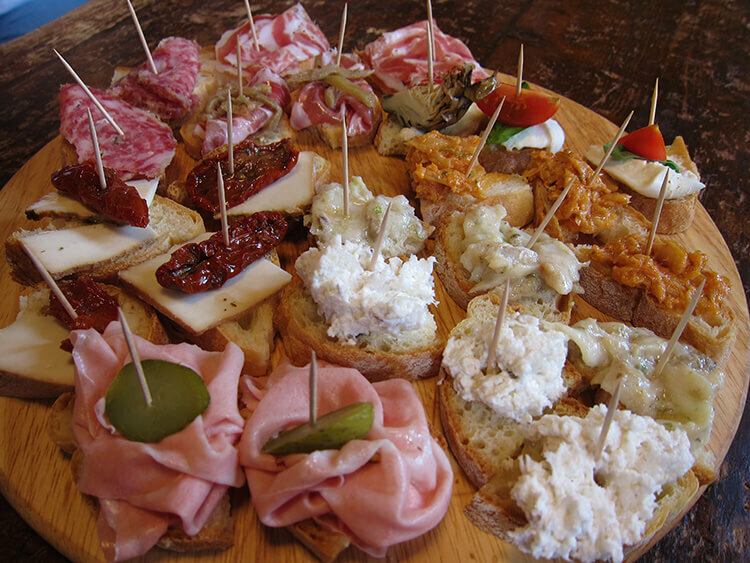 Especially about the Bacari crawl…those pictures of the cicchetti had my stomach growling! Venice is a funny place. Tourists are always so afraid to get lost so I think people just flow with the crowd and hit the usual spots. But the thing with Venice is that it’s a small island and you can only get so lost. 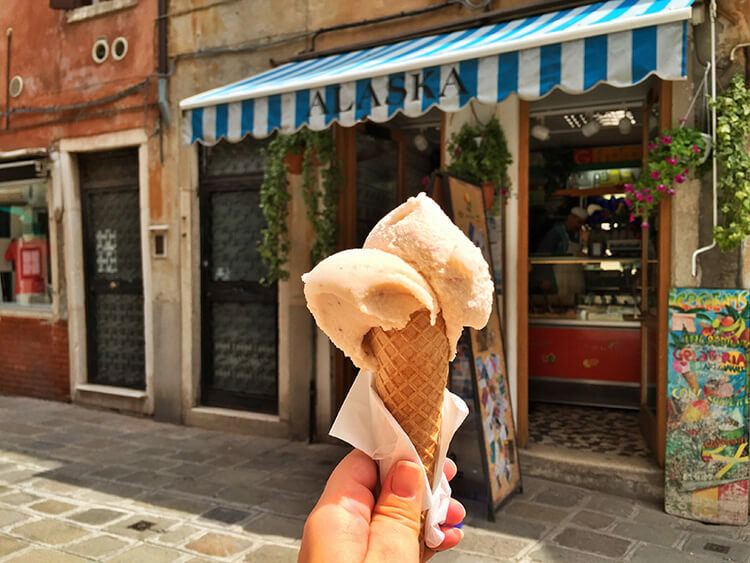 And when you do, that’s when you stumble upon the real Venice and the best little bites and sights. I have to add Venice to my travel plans next time I’m in Europe. That bacari crawl looks like my cup of tea! You’ll fit right in with the Venetians if you do a bacari crawl! It’s been a few years since I visited Venice but my sister just went there for a few days, wish I could’ve passed on some of your recommendations. Really want to get onto that bell tower next time, the birds eye view looks beautiful! The bell tower is really a hidden gem that almost no one knows about! I didn’t know you could learn to be a gondolier! I’d much prefer that than simply riding one. That gelato looks scrumptious! So much to do in Venice, such a beautiful place. The gondola rides are so Disney like these days – the gondoliers shouting complaints back and forth to one another and traffic jams. It’s one of those things everyone thinks you just should do, but I agree that learning to row one is a much more unique experience.